UroNav – Cutting edge screening, diagnosis and interventional solutions for prostate care. Current methods of prostate cancer screening, such as prostate-specific antigen (PSA) tests and digital rectal exams (DRE), are somewhat unreliable and can lead to many uncertainties for both patient and urologist. Prostate biopsy, the most reliable method of detection, is a challenge because of the difficulties in visualizing not only the entirety of the prostate, but also the location of the biopsy needle. Trans-rectal ultrasound-guided prostate biopsy (TRUS), the current biopsy standard, commonly suffers from poor image resolution, and the biopsy needle often passes through tumor-free areas of the prostate – potentially missing the tumor entirely. In addition, it can be difficult to distinguish between lesions that necessitate only a “watchful waiting” period and more aggressive lesions that require therapy. A more confident characterization of the type of lesion could help avoid the risk of side effects such as incontinence, impotence and bowel problems that can result from therapy. Targeted MR/ultrasound biopsy is poised to become a new standard in prostate care. This technique fuses pre-biopsy MR images of the prostate with ultrasound-guided biopsy images in real time, for excellent delineation of the prostate and suspicious lesions, as well as clear visualization of the biopsy needle. The fusion of the MR and ultrasound images uses electromagnetic tracking, similar to your car’s GPS system. A small, localized electromagnetic field is generated and used in conjunction with a navigation sensor mounted to the trans-rectal ultrasound probe to determine the location and spatial orientation of the biopsy device. A sophisticated algorithm maintains the fusion of MR and ultrasound images – even when the patient moves. UroNav fusion biopsy system from Invivo enables easy clinical use of this remarkable MR/US fusion technique. It combines electromagnetic tracking and navigation with an on-board computer and a real-time imaging interface in one easy-to-use, mobile workstation. The combination of UroNav with Invivo’s powerful MR ultrasound solution for the evaluation and biopsy of suspicious prostate lesions. UroNav is vendor independent, so it can accommodate MR data from MR scanners and interface with common urology-based ultrasound systems. * This enables a high level of collaboration and a virtually seamless interface between radiologist and urologist, without disrupting your current workflow. 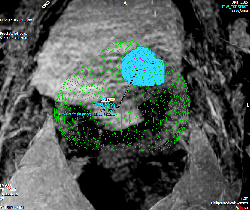 Prostate and lesion segmentation data from DynaCAD for Prostate are quickly and easily transferred to UroNav for review and target identification. Advances in multiparametric magnetic resonance imaging of the prostate now enhance the ability to visualize and evaluate clinically significant prostate lesions. Invivo now brings this important diagnostic information to the urology suite in a simple and intuitive workflow. 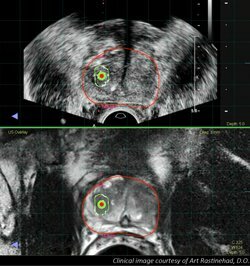 DynaCAD for Prostate provides the diagnostic MR information needed for the fusion biopsy by automatically transferring the relevant prostate images and lesion location data over your computer network for lesion identification and guidance during the TRUS biopsy procedure. With UroNav, there is no need for complex mechanical devices or complicated, time-consuming set-up routines. With a simple click, the navigation sensor, which is factory-calibrated and matched to your ultrasound system*, attaches to your existing ultrasound transducer. Position the navigation system above the patient and you’re ready to take advantage of UroNav’s simple, guided workflow – which follows the same TRUS biopsy procedure that you are used to. Familiar freehand technique provides complete range of motion and unrestricted access to difficult locations within the gland. Elastic (deformable) and rigid registration options allow you to select the registration technique best suited for your patient data. On-the-fly registration adjustments can be made in seconds without the need to restart the fusion procedure. Systematic biopsy planning provides needle placement guidance for additional samples. Display of multiple biopsy sub-targets within a larger region of interest (ROI).